1. So are the green-skinned dudes and the dudes that look like giant Altos all Zentraedi? I was kinda confused by this, though ultimately I assumed they were all the same race. 2. I know there’s no way that this is going to turn out to be true, but everytime I look at that squiggly critter that Ranka picked up my brain screams “Vajra baby!! Kill it! Burn it! Quarter it!” etc. 4. It strikes me that the Deculture thing can be used to model American neo-con views on the Middle East. Give them democracy, Coke and pop concerts and they’ll hang up their arms, forget their petty squabbles and just dance. Middle Easterners are Zentraedi in this view. 5. Well, Ranka certainly rankles Sheryl. I don’t see that they have much love for each other at all. Ranka is totally focused on Alto’s well-being and sees absolutely no problem in leaving the sick Sheryl behind (I guess it’s payback after all). Alto at least has a pang of conscience but ultimately for him the choice is between sitting by a sickbed or hopping on his variable fighter (in a planet with atmosphere..woohoo!). The choice is really no choice at all for him! ~ by Haloed Bane on December 12, 2011. You should mean: “Especially if American political leaders believe that Middle Easterners are giant, degenerate moefags”..
To be fair they don’t show Ranka’s reaction at all to leaving Sheryl behind the next time you see her she’s in the plane already. Although I do consider this episode karma coming back at Sheryl but probably way more then she deserved considering how I view this episode. Sheryl and Ranka’s relationship is really a weird one though because they don’t really interact with each other much or even talk about the other one much at all. I think trying to figure out what Sheryl thinks of Ranka is probably the one thing I don’t truly understand in this show. Also I believe this is the first time Alto shows interest in one of the girls out of his own free will during Ranka’s concert when he jumped on his plane and flew up to her and blushed. So he is a normal guy after all just he’s kind of unaware of his own feelings. This is why I say you really have to look at his reactions and emotions closely to truly understand him. I actually view him completely differently from a week ago. It’s just nothing he does is easy to understand without context of everything else he does in terms of the love triangle, it’s like piecing together a puzzle really. They don’t show her reaction, but we can tell from the way she behaves once they are on their way that she is not too upset, definitely. Hmmmmmm…I’ll have to keep watching Alto closely. He still seems to me quite cold. Yup, if Michael was the lead it’d be a totally different show!! I really don’t think Sheryl and Ranka have all that close a relationship. Ranka admires her but I don’t think it really goes beyond that much and Sheryl well like I said I’m not really sure. I do have an idea but that is based on major spoilers. I’d say the more note worthy aspect of their joy ride is Alto. First, yeah he completely is thinking of only Ranka here in fact he’s blushing again thinking about what she did earlier. I don’t consider Alto cold in the slightest here in fact I consider this one of the nicest moments in the series and a favorite of mine (this whole episode is just great imo). In fact Alto even laughs here, how often have you seen him laugh in this show (this might be the only time I am not sure I didn’t really notice this until someone else pointed it out). But it’s definitely these little things that are most important. I completely understand you wanting to swap out Alto I was like that at this point. I’ll be interested to see what you think by the end. As for the culture shock aspect, I’ve seen it suggested that it actually relates somewhat to Japanese cultural experiences. After Japan was forced out of isolation many Japanese went overseas for education and came back after having adopted western mannerisms. The parallel is much more obvious in the original TV series where Zentraedi spies were the ones who brought human culture to their fleet (the Do You Remember Love? movie had a cheesy explanation about music awakening the culture in the Zentraedi’s genes). One of the funny things about Sheryl and Ranka is that neither girl ever seems to seriously resent the other for her actions. It’s their respective supporters in the shipping war who get enraged by perceived actions against their chosen girl. Granted there are times where the girls’ lack of animosity seems a bit unrealistic given their viewpoints on the situation. I as a member of the audience may see Sheryl’s inviting Alto to Gallia IV as being a well intentioned attempt to give someone she cares about a chance to fulfill his biggest dream (I still think that Ranka was basically a non factor in her decision to do that) but as a member of the audience I get to see things that Ranka doesn’t (plus even when she does see things I’m seeing them from the perspective of a observer rather than that of a participant). The only thing I’d argue with this is that Sheryl did actually know what Ranka’s plans were when inviting Alto. I mean yeah your right she probably wasn’t thinking “haha this will ruin Ranka’s plans” when she stole Alto away but it was bad karma still and not really nice. But I understand your shipping war point, I try to see both sides of an issue but this one of the few that I just think Sheryl was clearly in the wrong for doing even if her heart wasn’t meaning to wrong Ranka. While Sheryl probably realised that her gift would interfere with Ranka’s plan, I suspect that didn’t realise that until after she had already made the decision to invite Alto to Gallia IV. She was very excited after she realised she had an opportunity to help Alto fulfill his biggest dream (I don’t think she had many close personal relationships before coming to Frontier -being able to offer someone like Alto a chance like that is a big deal for her). Now granted Ranka is also very excited about the gift she’s offering Alto. But when you get right down to it, whose birthday is it, Alto’s or Ranka’s? Should Sheryl refrain from giving Alto a chance to fulfill his biggest dream because Ranka wants him to be at her concert? I don’t even consider that what she offered was wrong necessarily it was they really didn’t bother to inform Ranka or make any kind of effort to rectify the issue when she did in fact realize this was going to hurt Ranka. I mean they send Michael out there? This is the future she has a phone, at the very least send an apology and offer some way to make up for it. I just think Sheryl could have handled this in a much better way that doesn’t come across as throwing a friend (I’m not sure if they really are friends though) under the bus for yourself. But I suppose this whole show is full of the three of them being unable to properly communicate with each other so I guess I can’t fault her too hard here (it’s still bad karma). Also I disagree that she was offering him his biggest dream, she was offering him a way to run away from his problems. Then again from everything I have come to understand of Alto his dream is truly freedom rather then flying (this is more of something that he associates with freedom which is why he loves it) so I suppose it was in a way, just not in a way that would last very long. A key issue here is that Sheryl is clearly threatened by Ranka’s rise to stardom and a growing doubt within her that she herself is already a has-been.. Question is, is she already feeling threatened by Ranka’s professional success or are you merely picking up on the things that lead to her feeling threatened by that success later on? Personally I don’t feel that worrying about Ranka was a major factor in Sheryl’s decision to invite Alto to Gallia IV. I’ve got pretty into choosing gifts for people in my family before; I find the idea that Sheryl was excited about being able to offer Alto an awesome birthday present pretty convincing. And as noted previously, she seems to come up with the idea while she’s still flaming mad from the argument about whether she’s actually well enough to go to Gallia IV or not. I kind of doubt Ranka factored into that. I don’t think Sheryl would mind having a good rival, it’s more the fact that she’s gotten sick and hates being weak and unable to sing for the Zentreadi. I don’t think that it was Ranka’s success that bothered her as much as the fact that she couldn’t accomplish her goal to impress the Zentreadi who clearly had prejudice against her. She’s Sheryl Nome, strong, proud and proffesional. She hates the fact that she failed and couldn’t help it. I honestly feel you can’t get a true gauge of her actions here and many other places until you watch the whole series, I just feel so much of this stuff changes in context once you get to understand her and her fears better. In fact if you watch this show a second time it might seem completely different to you imo. But I can already tell the others here probably disagree with what I think so take from that what you will. The Zentraedi (those that are not ‘cultured’) are meant to be in a way like children. Innocent and easily fooled. So I guess you have a point about how ‘Deculture’ works. And no doubt the UN Spacy has known how to milk their entertainment for all that it’s worth. But it’s important to remember,that hundreds of years of genetic engineering and indoctrination are always lurking beneath the surface when it comes to the Zents. Almost every Macross (Zero doesn’t count since its a prequel) portrays at some point how hard it is for Zentraedi to keep their tempers in check and not to resort to violence. They are not the ‘bon sauvage’ of romantic primitivism. So Deculture is not a ‘one size fits all’ solution for their issues. What threw me off was the obvious difference between the green-skinned hairless Zentraedi and the rebels that essentially look like giant Altos. BTW, Is Zentran and Zentraedi the same thing?? They are basically using the character designs from both the TV series (normal looking) and Do You Remember Love (green guys) somewhat indiscriminately. Remember that Kawamori cares little about canon so he mixes it up as he sees fit. As far as I know, Zentraedi is the name given to the entire species, whilst Zentran are the males and Meltrans are the females. Since they don’t actually interact unless they’ve been ‘cultured’, such a differentiation is necessary. No, because Michel is a womanizer and he did hit on Sheryl, who declined. Michel only cares for Klan, the rest are just that. Flings. And Ranka… uh, no, I can’t see him interested in her at all. His the one who called her out for being childish a couple of episodes back. Klan is a child in her micloned form but she’s still a grown woman on the inside when it comes to serious situations. Yes. And the deculture factor (and that all Zentreadi are lolicon) goes back to SDFM. 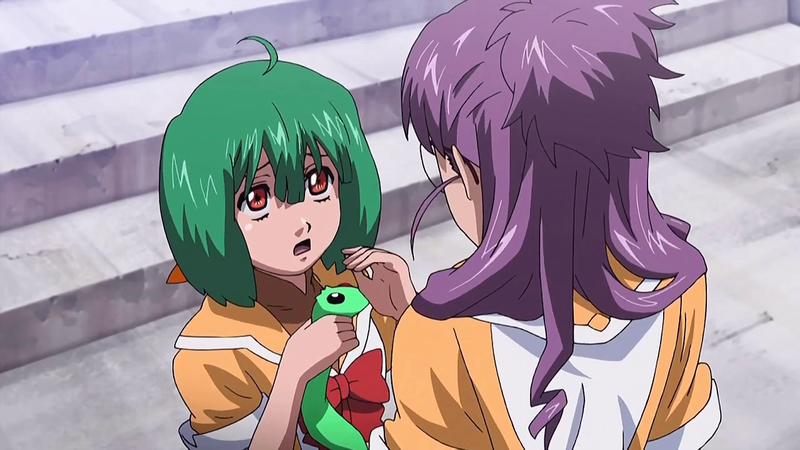 Sheryl does care for Ranka, she even offered to help her advance her career. It’s Ranka who doesn’t give two fs about Sheryl and thank you, your the first person I’ve seen who sees it this way. I never understood what people meant by the girls having a bond in the series. The movies handle it better. To be fair, it’s thanks to Sheryl that he got there in the first place and Michel was the one who talked him into taking Ranka home. At this point in time all Michel knows is that Ranka is in to Alto and probably wants Alto to man up and decide if he likes her too. The possibility of Alto having feelings for Sheryl or both girls didn’t cross his mind yet. Michel is still a womanizer, and he tries to charm Sheryl, but Sheryl’s too smart for him and keeps crushing him. And yet she starts to feel something for him. In the meantime, Ranka develops her own crush for Michel. Michel is not interested, but at at point in his life where it all feels empty he suddenly starts to find that innocence alluring somehow. And on top of that he’s got the hots for Alto, since he met him at a kabuki performance before finding out he was a man and not a gorgeous lady. THIS THING WRITES ITSELF. Wow!! I agree Michel played on Alto’s feelings to get him to take Ranka home but still, the man knows how ill Sheryl is… I would have stayed myself in that situation..
Sheryl cares for Ranka about as much as Ranka cares for Sheryl. I mean Sheryl is definitely interested in Ranka since she could see her talent/potential and did offer some advice because I think both look at each other in a positive light but this is far from caring. I didn’t see anything that really stood out to me that showed either really cared for each other as people instead it was all mostly about being idols. Do they even know one thing about each other or even talk about non idol things or Alto? I’m not sure but I don’t remember it if they do. I just consider their relationship horribly done in this show to the point that I want to just strike it from the records and instead think of the movie relationship. Relationships between women are complicated things (sorry for the stereotypical male view~). Yeah I like the way you put that better. I’m going to convince myself they hate each other soon at this rate. I’m sure they both care for each other, I just blame poor writing especially in this episode in regards to this. It’ll take more time for Alto to get his own priorities straight. First he ditched Ranka to go fly and then Sheryl to go fly. What’s interesting now, looking back is the gifts the girls gave him. 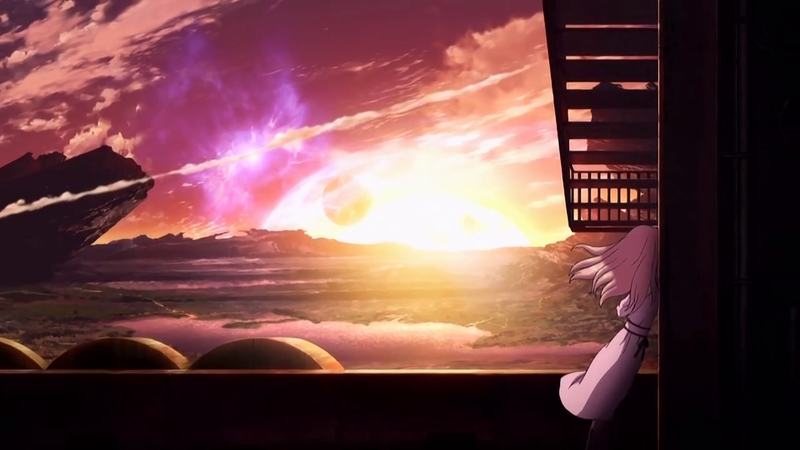 Sheryl gave him the sky, a present that was about Alto, while Ranka sang, which was a gift about her. Also note that Ranka still has no idea why Alto ditched her in the first plce and doesn’t ask either. She still doesn’t know why Alto likes to fly, while Sheryl asked him early on. But Alto liked both presents in the end. At this point in the series he is playing oblivious to the feelings of the girls most likely because he still has other issues to deal with and has time. I also think his feelings weren’t strong enough for either of them yet. He knows about Ranka’s memory issue and sad past and is trying not to damage her. Sheryl on the other hand has been playing up the “strong woman” part and for all they both know she could have just caught the floo. That can also explain why he decided to give in to Michel’s idea. The problem with Michel is that even without Klan I can’t see him interested in Ranka. His not into innocent little girls. I could see a rivalry between Klan and Sheryl though. Klan would win, but it would make for an interesting alternative series. Then again, if it was one sided on Ranka’s part, maybe a crush on Michel would do her good. At least the guy’s not another yes man in her life. But I could turn things around and say Sheryl is just using the flying hobby to get Alto on her side, whereas Ranka just opened his heart to him (which is what dedicating a song to someone is all about). It kinda depends on how you spin it, no? At this point I imagine the writers want us to believe that both women are trying to please him with their gifts. I honestly don’t know what the writers intended for us to think Alto is thinking deep inside. I see, I see. Hmmm, I wonder what happens next…! I’d also add that Alto left Sheryl with someone he trusted. Plus I think he felt he owed Ranka after she risked her life to save his.